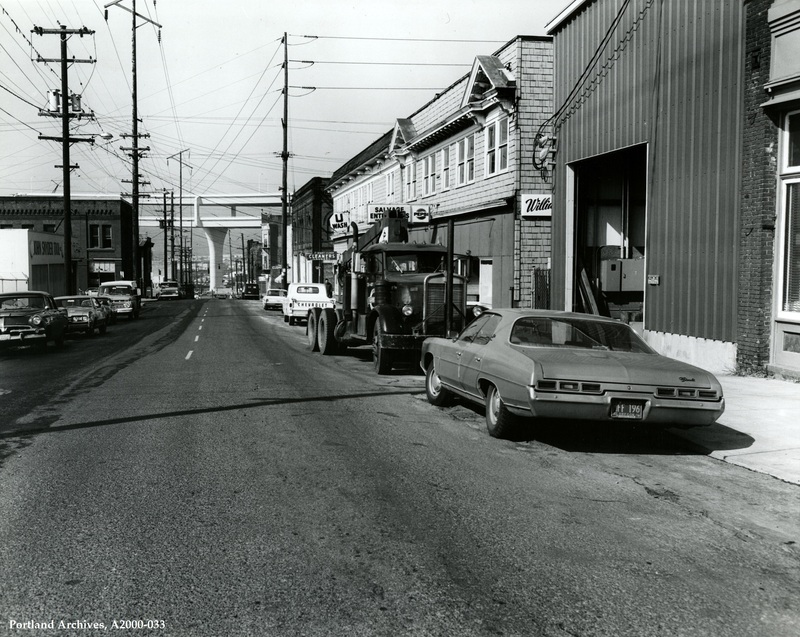 Looking west on N Russell Street near N Borthwick Avenue, 1974. This image was taken as a part of the Emanuel Hospital Urban Renewal project. Is that brick building on the left the old White Eagle Saloon? If so, that is where after work in the 70s I spent many a night drinking cheap beer and throwing peanut shells on the old wood floor. Good times. I think that is the old White Eagle. I know it’s still standing. I think the White Eagle is just past the prominent brick building. Look at that brand new, pristine and white Fremont Bridge!! There is no Fremont Bridge in the photo I am looking at. Those white elevated roadways ARE the approach ramps to the Fremont Bridge. I dont see the Swinging Anchor tavern… This pic might be just beyond it. Thank goodness that place burned in the 80s, was an evil place. But would no doubt gone gentrified as the rest of this area. Btw, i wonder if that Willys stationwagon just past the cleaners is the same one the cleaners owner had at least until the 90s ? 43 years later it looks like all the buildings are still there (…for the moment). Notice the approach spans to the Freemont Bridge. Nice, white, and not covered in graffiti or paint peeling off. Also notice that only the approach span appears to be built… the road deck abruptly cuts off in the extreme upper left of the photo. I’m curious if that apartment compels on the right will be rebuilt or torn down soon. It’s awful shape and boarded up today. It would be sad to see it go though. Hopefully someone can restore it! Notice that half the building on the right (the one that is in bad shape today) has been torn down, replaced by a parking lot. Wow, that old building is still standing? I haven’t been by it in several years, but I remember seeing it over 10 years ago and being surprised it hadn’t been torn down yet. Now I’m absolutely shocked it hasn’t been torn down. @Mark, I’ve always wondered the same thing too! That house is like a flashback to N. Williams/Vancouver 20 years ago!